The MEG1584 Meredith and Eyre single Axle 8’ x 4’ Goods/Plant trailer is built to last, with a heavy duty draw bar arrangement, and a Locking 50mm Ball Coupling as Standard. A Forged 40mm Eye Coupling is also available, as a no cost option. 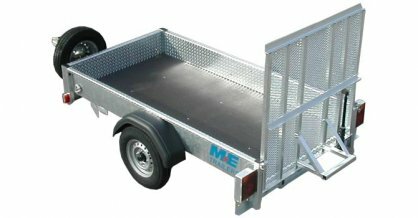 The MEG1584 Trailer has a fully welded heavy duty chequer plate body which is Hot Dip Galvanised, as are the optional Loading Ramp and Weld Mesh Side Extensions.